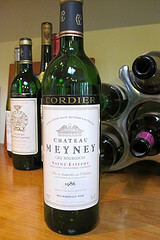 The 1980s vintages of Chateau Meyney were one of our house wines for many years. Now, of course, only the most long-lived vintages are still going strong. Among these, the 1986 is a sentimental favorite because that was the year Helen and I got married. So I opened a bottle tonight as we celebrate our 25th anniversary. At age 25, the Meyney is amazing -- and still improving if my note from 2003 is any guide. It is still a deep ruby in color. The bouquet is huge, permeating the dining room with scents of prunes, cassis, leather, tobacco, and cedar. On the palate, there is still a stunning amount of rich black fruit. Plus, mocha and toffee. How much longer does it have? Maybe 5 years. Maybe 10 if impeccably cellared in some Scottish Highland castle's wine cellar where the temperature never varies from about 45 degrees. But it is delicious to drink now. The last two bottles in my cellar should be worried, because I'm coming for them. As strong as the case for an Alchian Nobel is, the likelihood of a solo Nobel in the areas of the theory of the firm or property rights is unlikely. And what better way to share the prize than with two co-authors who have made substantial and significant contributions, but individually and collectively, to economic problems involving the theory of the firm, property rights and transaction cost economics taking a similar methodological approach and bringing distinction to the UCLA School of economics. I’ve written extensively about Klein’s contributions here. But the most well known contributions (in addition to Klein, Crawford Alchian (1978) and the important exchange between Coase and Klein concerning asset specificity, vertical integration and contracting) include Klein & Leffler (1981), Priest & Klein (1984), Klein and Murphy (1988) and Klein (1995) and Klein (1996) ranging on topics from the role of reputation in the design and performance of contracts, the seminal model of litigation and settlement, vertical restraints, and the economics of franchising. 1967, “Toward a Theory of Property Rights,” American Economic Review. 1968, “Why Regulate Utilities?” Journal of Law and Economics. 1969, “Information and Efficiency: Another Viewpoint,” Journal of Law and Economics. 1972 (with Armen Alchian, “Production, Information Costs and Economic Organization,” American Economic Review. 1973, “Industry Structure, Market Rivalry and Public Policy,” Journal of Law and Economics. 1979, “Accounting for Advertising as a Barrier to Entry,” Journal of Business. 1982. Economic, Legal, and Political Dimensions of Competition. 1988. The Organization of Economic Activity, 2 vols. Blackwell. Reprints most of Demsetz’s better known journal articles published as of date. 1994 (with Alexis Jacquemin). Anti-trust Economics: New Challenges for Competition Policy. 1995. The Economics of the Business Firm: Seven Critical Commentaries. 1997, “The Primacy of Economics: An Explanation of the Comparative Success of Economics in the Social Sciences” (Presidential Address to the Western Economics Association), Economic Inquiry. And of course, most recently, Professor Demsetz released his newest book, From Economic Man to Economic System on Cambridge University Press. Josh's post has lots of quotes from leading figures praising the trio, especially Alchian. People like Andrew Sullivan and left-liberals (or is that redundant these days?) would be having a fit. After all, assassinating an American citizen without anything remotely approaching due process of law is stretching the bounds of lawful warfare to the breaking point. But because Barak Obama did it, it seems to be okay. Which is damned lame. Update: Commenter Chris Tompkins opines that "Andrew Sullivan is ambivalent. Glenn Greenwald is definitely having a fit." Back in 2001, I wondered if Bush would be the president to win this war, while hoping he would. I wondered if his errors might lead to a successor who learned from them. That hope has now been fulfilled - more swiftly and decisively than I once dared to dream about. As far as I call tell, Sullivan still views Obama through the proverbial rose colored glasses most of the time. I'm going to be on a panel here at UCLA on Thursday along with several other corporate governance theorists. We've each been given 5 minutes to summarize our theory. Naturally, I'll be talking about director primacy. Obviously, it will be very difficult to summarize any theory of corporate governance in 5 minutes, so I will direct both my listeners and you, my readers, to my book The New Corporate Governance in Theory and Practice. Director primacy is board-centric, but shareholder wealth focused. Director primacy thus differs from both shareholder primacy and Stout & Blair’s team production model, not to mention the various stakeholder theories. I claim that the debate between these models has conflated the means and ends of corporate governance. For example, shareholder primacy really makes two distinct claims. As to the ends of corporate governance—in other words, the social purpose and role of the corporation—shareholder primacy claims that the duty of directors and managers is to maximize shareholder returns within the bounds of law. Director primacy concurs. As to the means of corporate governance—who ultimately has decision-making authority—shareholder primacy says it is—or, rather, ought to be—the shareholders. Here, director primacy says no. The powers of the board of directors are original and undelegated. The board of directors is the nexus of corporate contracts. The shareholders’ claim on the corporation is merely one of those contracts. The intersection of the power of directors to manage the corporation and their obligation to do so in the shareholders’ interest creates a variant of the principal-agent problem. There is a core tension between the board’s authority and the need to ensure that the board uses its authority responsibly. Shareholder voting rights are one of the mechanism by which directors are held to account. If we try to make more of shareholder voting, if we try to elevate it into a functioning part of the governance system, however, we undermine the centralization of power in the board that makes the modern public corporation possible. The power to review, after all, is the power to decide. Every time we increase the shareholder’s right to review board decisions, we are thus undermining the core of corporate governance by shifting the power of decision to shareholders. This transfer of authority from board to shareholders is undesirable in itself. Director primacy thus calls for constraints on proposals to expand the role of shareholders in corporate governance. ​Join UCLA School of Law, The Aspen Institute and top thinkers in business and law to explore what priorities are legally demanded of corporations, rethink what is meant by "creating shareholder value," and ask "What really is the purpose of the firm?" Panelists include Professor Stephen Bainbridge, UCLA School of Law; Professor Henry Hansmann, Yale Law; and Roger Martin, Dean, Rotman School of Business, University of Toronto. The panel will be moderated by Professor Lynn Stout, UCLA School of Law. In light of all that has happened in financial markets and the economy over the past several years, has your thinking changed about the purpose of corporations and their role in society? People get religion about ethics and corporate governance in down markets. When things are going well, they tend to forget about it. Given the savage economic downturns that bookended the last decade, it is hardly surprising that legislators, regulators, business people, and investors have gotten the corporate governance religion. But have they found true religion or are they worshiping false idols? The economic crises of the last decade prompted two sweeping federal statutes affecting corporate governance. In response to the scandals that followed in the wake of the dotcom bubble, Congress passed the Public Company Accounting Reform and Investor Protection Act of 2002 (Sarbanes-Oxley or SOX), which President Bush praised at its signing for having made “the most far-reaching reforms of American business practices since the time of Franklin Delano Roosevelt.” At the end of the decade, when the economy suffered through an even worse downturn following the bursting of the housing bubble and the subprime mortgage crisis, populist outrage motivated Congress to pass the Wall Street Reform and Consumer Protection Act of 2010 (Dodd-Frank). Sarbanes-Oxley and Dodd-Frank are the latest iterations of the recurring pattern of federal intervention in corporate governance. In the United States, regulation of corporate governance traditionally was the states’ job rather than that of the federal government. Since the New Deal, however, the federal government repeatedly has responded to major economic crises by significantly expanding its role in corporate governance regulation. In an influential law review article, which slammed the Sarbanes-Oxley Act as “quack corporate governance,” Yale law professor Roberta Romano singled out five of Sarbanes-Oxley’s corporate governance provisions for detailed criticism. First, she criticized Sarbanes-Oxley § 301’s mandate that all public corporations must have an audit committee comprised exclusively of independent directors. Romano contended that the empirical evidence on the efficacy of director independence in general and audit committee composition in specific was, at best, mixed. Second, she pointed out that § 201 prohibited accounting firms from providing a wide range of non-audit services to public corporations they audit, even though the weight of the evidence was that provision of such services did not degrade audit quality. Third, she argued that § 402(a)’s prohibition of most loans by corporations to their executives was unjustified because such “loans in many cases appear to serve their purpose of increasing managerial stock ownership, thereby aligning managers’ and shareholders’ interests. . . .” Fourth, she argued that §§ 302’s and 906’s CEO and CFO certification rules imposed significant costs even though the evidence as to whether such certifications provide useful information to investors was ambiguous. Finally, she correctly predicted that § 404’s requirement that management and the firm’s outside auditor certify the effectiveness of the company’s internal controls over financial reporting would prove hugely burdensome. By the middle of the decade, experience with the high compliance costs imposed by the Sarbanes-Oxley Act, especially § 404, generated significant push back from the business community. The SEC and the Public Company Accounting Oversight Board (PCAOB) offered several iterations of regulatory relief. There was even talk of a legislative fix for § 404. The financial crisis of 2007–2008, however, brought talk of deregulation to an abrupt end. Instead, Congress began looking at a so-called “New New Deal,” which would undertake massive new regulation of the financial markets. In fact, however, systemic flaws in the corporate governance of Main Street corporations were not a causal factor in the housing bubble, the bursting of that bubble, or the subsequent credit crunch. In the wake of the earlier dotcom bubble, Bengt Holmstrom and Steven Kaplan published a comprehensive review of U.S. corporate governance concluding that the U.S. corporate governance regime was “well above average” in the global picture. Indeed, the trend throughout the last decade with respect to major corporate governance practices was toward enhanced management efficiency and accountability. Pay for performance compensation schemes, takeovers, restructurings, increased reliance on independent directors, and improved board of director processes all tended to more effectively align management and shareholder interests. These improvements had demonstrable results. Holmstrom and Kaplan showed that, even when the fallout from the bubble was taken into account, returns on the U.S. stock market equaled or exceeded those of its global competitors during five time periods going back as far as 1982. Likewise, U.S. productivity exceeded that of its major Western competitors. We can draw a couple of important conclusions from this evidence. First, what constitutes good corporate governance depends on which constituency’s interests one is seeking to advance. Governance regimes that advantage shareholders may not be good for taxpayers. As we will see, however, virtually all of the reforms mandated after the crisis were designed to empower shareholders. The risk thus is that the reforms may make the next crisis more likely and potentially more severe. Second, one size does not fit all in corporate governance. The problems of Wall Street and Main Street are quite different and may require quite different solutions. As we will see, however, the response to the crisis consisted almost without exception of one-size-fits-all mandates, from which derogation by private ordering is not allowed. Why did corporate governance veer in untoward directions after the crisis? The crisis shifted the corporate governance game onto a new playing field and created an environment in which a new set of players took prominence. Specifically, it reengaged the federal government as a regulator, bringing with it powerful interest groups like unions, pension funds, activist investors, trial lawyers, and their academic allies. Are Dodd-Frank’s governance provisions quackery, as were Sarbanes-Oxley’s? In my forthcoming book, I offer an affirmative answer to that question. Without exception, the “reforms” lack strong empirical or theoretical justification. To the contrary, there are theoretical and empirical reasons to believe that each will be at best bootless and most will be affirmatively bad public policy. Finally, each of Dodd-Frank’s governance provisions erodes the system of competitive federalism that is the unique genius of American corporate law by displacing state regulation with federal law. Dodd-Frank is thus shaping up to be round two of federal quack corporate governance regulation. You did preorder my book, Corporate Governance After the Financial Crisis, didn't you? If not, you can go do it now from Oxford or Amazon. The number of publicly-listed US firms has declined from nearly 9,000 in 1997 to only about 5,000 today. What’s more, many of the firms that do go public (LinkedIn, Google, Zynga) have dual-class shares. Do these two data points suggest that the public corporation is a less attractive way to do business? If so, why? I addressed the first prong of this question at some length in my paper, Corporate Governance and U.S. Capital Market Competitiveness (October 22, 2010), which is available at SSRN: http://ssrn.com/abstract=1696303. My essay argues that litigation and regulatory reform remain essential if U.S. capital markets are to retain their leadership position. Unfortunately, the article concludes that federal corporate governance regulation follows a ratchet effect, in which the regulatory scheme becomes more complex with each financial crisis. If so, significant reform may be difficult to achieve. There are three major reasons why federal intervention in corporate governance tends to be ill conceived. First, federal bubble laws tend to be enacted in a climate of political pressure that does not facilitate careful analysis of costs and benefits. Second, federal bubble laws tend to be driven by populist anti-corporate emotions. Finally, the content of federal bubble laws is often derived from prepackaged proposals advocated by policy entrepreneurs skeptical of corporations and markets. In her critique of SOX, Roberta Romano proposed that these problems could be addressed in several ways: "The straightforward policy implication of this chasm between Congress’s action and the learning bearing on it is that the mandates should be rescinded. The easiest mechanism for operationalizing such a policy change would be to make the SOX mandates optional, i.e., statutory default rules that firms could choose whether to adopt. An alternative and more far-reaching approach, which has the advantage of a greater likelihood of producing the default rules preferred by a majority of investors and issuers, would be to remove corporate governance provisions completely from federal law and remit those matters to the states. Finally, a more general implication concerns emergency legislation. It would be prudent for Congress, when legislating in crisis situations, to include statutory safeguards that would facilitate the correction of mismatched proposals by requiring, as in a sunset provision, revisiting the issue when more considered deliberation would be possible." In adopting Dodd-Frank, Congress ignored that advice. As a result, Dodd-Frank suffers from the same three flaws as its predecessors. The federal role in corporate governance thus appears to be a case of what Robert Higgs identified as the ratchet effect. Higgs demonstrated that wars and other major crises typically trigger a dramatic growth in the size of government, accompanied by higher taxes, greater regulation, and loss of civil liberties. Once the crisis ends, government may shrink somewhat in size and power, but rarely back to pre-crisis levels. Just as a ratchet wrench works only in one direction, the size and scope of government tends to move in only one direction—upwards—because the interest groups that favored the changes now have an incentive to preserve the new status quo, as do the bureaucrats who gained new powers and prestige. Hence, each crisis has the effect of ratcheting up the long-term size and scope of government. We now observe the same pattern in corporate governance. As we have seen, the federal government rarely intrudes in this sphere except when there is a crisis. At that point, policy entrepreneurs favoring federalization of corporate governance spring into action, hijacking the legislative response to the crisis to advance their agenda. Although there may be some subsequent retreat, such as Dodd-Frank’s § 404 relief for small reporting companies, the overall trend has been for each major financial crisis of the last century to result in an expansion of the federal role. The unfortunate conclusion thus seems to be that there is no cure insight for the corporate governance aspects of the American Illness. My commute here in Los Angeles normally takes 20-30 minutes as I go from Hollywood through Beverly Hills to Westwood. Last night, however, to took over an hour-and-a-half. Why? Because man of the people/campaign finance reformer Barack Obama has decided to raise the unprecedented figured of $1 billion to finance his reelection campaign. So last night he had a huge fundraiser at House of Blues on Sunset for all his Hollywood limousine liberal fat cats, which triggered massive street closures just as I was trying to get home. This morning it took me two hours to get to work. Why? Because Obama had to have a fundraising breakfast with yet more liberal millionaires with more money than sense at the Beverly Wilshire, after which he motored through Beverly Hills to the VA facility in Westwood to board Marine One. Again, massive street closures. So I'd like to thank the PUTZ POTUS for making life for the rest of us just that little more miserable so that he can waft from fundraiser to fundraiser unimpeded. But I'd also like to suggest that he and his entourage haul their fraking behinds back to DC and do something useful. Ted Frank has collected some recent commentary on shareholder activism that's well worth reading. ... as if it were written by an alienated central European intellectual smoking bad cigarettes in a cheap urban room and getting a lot off his chest. Reason in law is a sham. It cannot be anything but a sham, and, since in liberal culture reason is the basis of law’s authority, liberal versions of law are and always will be shams. Reason can only be understood as a modest and inherently skeptical enterprise, one deeply incompatible with political rule. The rule of law is rule by the beliefs of those in power. Reason is merely power’s rhetorical cover. It signifies nothing, at least nothing honorable. ... Readers must know their Derrida, Foucault, Lyotard, and Nussbaum as well as their H.L.A. Hart, Dworkin, and Sunstein to follow the argument. We corporate law types don't run into Foucault very often and I could go the rest of my career quite contentedly without reading any more articles by or about Dworkin. Yet, having said that, I occasionally aspire to being an alienated Anglophile intellectual smoking bad cigars and drinking red plonk in some cheap Paris cafe. So that's a common bond right there. It's on law, politics, nature and culture. It will contain mini-essays, commentaries, and experimental-idea pieces on all these subjects (and perhaps more.) We’re trying to redeem through example and experimentation the idea that law is part of the liberal arts. I suspect I won't agree with very many of the normative and political claims advanced in the new blog, but early returns suggest that it's going to be well written, interesting, and provocative. Should be a good read, so I'm blogrolling it. My third favorite album is "deeply spiritual, intelligent and brave"
Quadrophenia is a work of genius. I am tempted to write that today's music is shallow compared to records like Godspell and Quadrophenia. But that falls into an argument that I disagree with -- that big, ambitious records about Life are always superior to simple pop music. To me, songs about cars and girls are not shallow; rather, the best of them deal with elemental questions of joy, love, and suffering. Yet it can't be denied: Quadrophenia is on an entirely different level than anything out today. Indeed. Go read the whole thing. The U.S.-controlled occupation imposed on Japan in the late 1940s an American-style securities statute. The U.S. statute did not ban insider trading at the time, and neither did the new Japanese law. Not until the 1960s did U.S. prosecutors and judges start to criminalize insider trading. Their Japanese counterparts did not follow their lead, and as of the mid-1980s had left insider trading largely unpoliced. In 1988, the Japanese Diet banned and criminalized insider trading. Rather than use a vague rule like 10b-5, it carefully specified which investors, which trades, and which contexts would trigger the ban. In 2004, it added an administrative surcharge regime. Commentators in Japan ostensibly urged the Diet to adopt the bill because they hoped to restore investor confidence in the stock market. If the ban restored investor confidence, it did not show. Shortly after the ban took effect, the Japanese stock market collapsed. In its third quarterly report of 2011, the UCLA Anderson Forecast says the outlook for the nation's economy is "far worse" than it was just three months ago. Considering the weak, revised data for the first half of the year, the forecast calls for average gross domestic product growth of just 0.9 percent on average for the five quarters — this year's four and the first quarter of 2012. "Simply put, the three sectors that would normally put the economy into recession are already depressed — housing, consumer durables and inventories," Shulman says. "Even if housing starts drop to new lows, this sector of the economy has shriveled so much that it would only have a modest impact on economic activity ... It is one thing for housing starts to decline from an annual pace of 2 million units to 1 million and quite another for starts to decline from 600,000 units to 300,000 units. On the employment front, Shulman writes, "Recession or not, the employment situation remains horrible. Job growth has stalled, and we forecast that the unemployment rate will soon rise to 9.5 percent. Thus, even by the end of 2013, we will not be back to the unemployment levels of late 2007." I occasionally ponder what to do when the lease expires next year. There was an interesting article in today's WSJ on Euro concept cars, which got me thinking. I thought the Volvo was especially attractive (but for the clam-shell doors). As long time readers know, I've been a coupe guy for quite a while. The 911 was preceded by a M3 convertible, which was proceeded by the X5 error, an interregnum over which it is best to pass quietly, which was proceeded by a 328 convertible, which was proceeded the Jeep Cherokee error (another era about which the less said the better), which was proceeded by a Mazda RX7, which was proceeded by the lamentable Ford station wagon (yes, the one with the portholes). Unfortunately, I find myself at a stage of life at which 4 doors is at least convenient and arguably essential. So I've been pondering the new 4 door coupes, like the Mercedes CLS, the Audi A7, or the VW CC. I've concluded that they represent an ideal blend of fun, looks, and practicality. I'd like (read need) to go a lot cheaper than the Mercedes and the Audi, and would prefer to go American. I was thinking that a Lincoln 4 door coupe based on the Taurus SHO would be a real halo car for that brand and a car I'd definitely need to consider when the lease on my E550 expires. The Mustang-based MKR concept from 2007 would likewise fit the bill. But is anybody in Detroit listening? Of course, in the unlikely event that Corporate Governance After the Financial Crisis hits the NY Times best seller lists when it comes out in a month or so, maybe I'll have to start looking at Panameras. I'm not counting on it, of course, but you could do your part by preordering your copy today. In contrast to the woeful LA Prawfs, the Unseen Academicals are 2-0 and tied for first place in the PB.com H2H PPR league. Ray Rice and Jahvid Best turned out to be great choices, especially given all the PPR points they've racked up. Jimmy Graham is playing as well as I had hoped with room to improve. DeAngelo Williams has been a major disappointment and has gone to the bench until he proves he's still at least a decent flex starter. Going forward, I'm worried about Matt Schaub. I picked up Ryan Fitzpatrick off the waiver wire. Fitz has outscored Schaub by about 30 points in the first two weeks. So do I start him in week 3? I don't like either matchup. This may end up being a coin toss Sunday AM. Looking specifically at week 3, do I start Julio Jones or David Nelson if Miles Austin can't play? Plus, do either of them (or Jared Cook) replace Robert Meachem at the flex? I think the answers are Jones at WR (I like his matchup better) and Meachem at the flex. I continue to play DSTs based on matchups. I dropped Houston and added SF this week, because the Niners DST should do well against Cincinnati.